Comments: Very nice site you created. You did a great job! Comments: HI I WANT TO THANK YOU FOR THIS PAGE I AM A GRANDMOTHER THAT WAS SEARCHING FOR SOME SUPPORT AGENCYS AND FOUND YOUR PAGE NOW I KNOW I AM NOT ALONE WITH MY PROBLEM I PRAY EVERY DAY FOR THE LITTLE CHILDREN IN THIS WORLD. GOD BLESS YOU. Comments: You did a great job. You are a wonderful person and if a wish counts, I wish you did not ever have to become one of us. Comments: I am also a survivor of abuse. I have links you might be interested in on my homepages. Comments: Loved your site especially the gone with the wind its one of my favorites. I also sent your site to my sister because she loves lighthouses. LOTH sister "Cookie"
Comments: Your message comes from the heart and I love your music and graphics too. You are from: Las Vegas, New Mexico, USA, Earth. Comments: What a beautiful and inspirational site. So much wonderful insight that is shared so many special women. I am so glad I found you. Comments: HI...EXCELLENT WEBSITE YOU HAVE HERE! Comments: What a wonderful site you have here! I love your use of color! I'm glad I came! Comments: WELCOME TO NET SISTERS! Comments: I think your site is very nice and will look closer at it as the days as go by. Comments: Welcome to Net Sisters. We are glad to have you here. Please accept my gift to you :-). Please accept my welcoming gift to you and feel free to come visit me anytime! I know that you'll just love being a part of Netsisters - they're the best group on the net! Comments: Hello and on behalf of the sistersart committee, I would like to welcome you to NetSisters. If you have any original piece of artwork that you do, we would love to have it displayed in our sistersart gallery. Comments: Great page! I stopped by to extend a warm welcome to NetSisters. You will find some truly talented, generous, friendly and really sweet people here! May ^A^ll Your Dreams Come True! Comments: Welcome to netsisters!! Hope you enjoy it and love your pages!!! 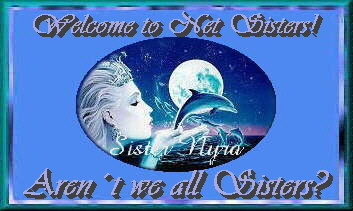 Comments: Greetings and Welcome from the Sisters' Aide Committee We want to extend a warm Net Sister Welcome to you and we hope you enjoy your new family. It's great to have a new sister. Please let us know if we can assist you in any way. We believe you've joined the greatest group on the Net! Hugs, Sister Santera Hiddenite, Sisters' Aide Committee Pearl, Causes Committee " " " "
Comments: A big Kentucky hug to my new NetSister! I'm so glad to have you with us. This is a warm, loving group of ladies and I know you're going to love being a part of our NetSister family. I hope you can drop in and visit me soon and that we can get to know each other much better. Please come by my NetSister page and pick up your special gift. Comments: Hi, I just wanted to swing by and welcome you into Net Sisters. I'm sure you'll love this group as much as I do. I look forward to getting to know you. Please come by and get your gift on my site. Comments: Wishing you a warm Welcome to Net-Sisters, It's a wonderful group. Believe Believe in yourself--in the power you have To control your own life, day by day. ~~~ Believe in the strength that you have deep inside, and your faith will help show you the way. ~~~ Believe in tomorrow and what it will bring, let a hopeful heart carry you through. ~~~ For things will work out if you trust and Believe there's no limit to what you can do! Comments: Hi Sis! 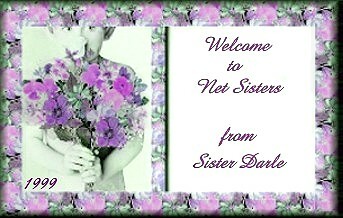 I just stopped by to welcome you to Net Sisters, I am sure you will enjoy being part of our wonderful group! Looking forward to meeting you! If you need anything, feel free to email me at any time or page me: ICQ #2893688! Welcome to Netsisters, a great group of ladies. If you need anything just give me a holler. It's great to have you with us!!! Please drop me a line if I can help you in any way. Comments: Welcome to Net Sisters! I know you're going to love being part of this wonderful group of women!! I you stop by my homepage, you can pick up your gift on my Net Sisters page!! Comments: Welcome to netsisters. What a lovely site you've made. Keep up the good work! Comments: Hey, wonderful page!! I'm looking at your faeries right now, they're soo beautiful!! Did you make the backgrounds? Great work!! Comments: Hey there, and welcome to the Net Sisters! Homepage URL: "The hands of Time"
Comments: Hi there and welcome to NetSisters! Comments: Welcome to Net Sisters!! Comments: Greetings! I'm Catalina from Net Sisters, and I was checking out your site to make sure everything was okay. It's a great site with good issues. Comments: Auds, I love your website. Especially the angel pictures. You are a truly remarkable woman!!! You are an inspiration to many, including myself. You are the most loving, caring, and selfless woman I know. Thanks for spreading the word that abuse is not to kept quiet. Love ya, girl! You are from: Ponca City, Okla. Comments: Please tell me where you get the time to do all this? I love your pages.